I want to formally introduce Johnson’s Jewelers of Raleigh and myself. My name is Caroline Upchurch and I am the Marketing Coordinator here at Johnson’s. I am a recent alumna of Meredith College (Go Avenging Angels!) with an eye for design, passion for marketing and an appreciation for all things sparkly, I plan to share happy tales from our customers, best buying practices, style updates and ongoing events at Johnson’s. I have grown up with the Lee’s as we are neighbors. 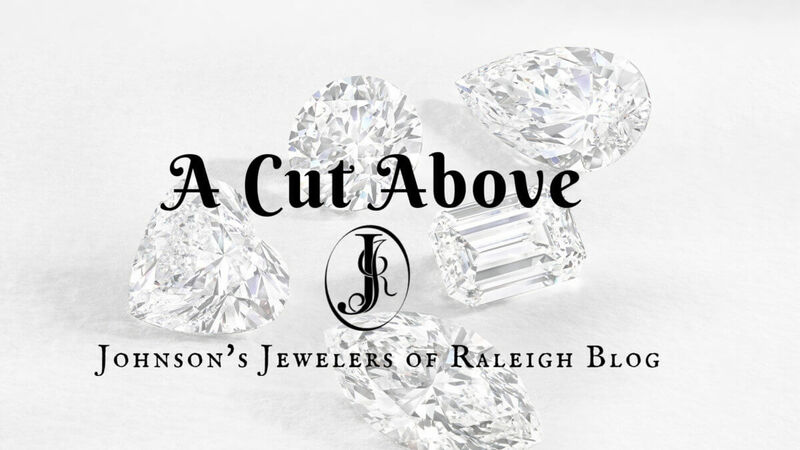 With an older sister and a twin sister that worked in the store throughout the years, it is my privilege and turn to contribute to the legacy of Johnson’s Jewelers of Raleigh. This has been and will be my family jewelry store and I hope you will think of it as yours too! Raleigh’s oldest and most trusted family jewelers — for three generations! From humble beginnings in 1929, Great Grandfather, Alton Johnson, and Great Grandmother, Lena Johnson, opened a small watch repair shop aptly named “Johnson’s” in downtown Raleigh. The store was decorated with a green motif, which can still be seen today in our packaging and other branded goods. Johnson’s Jewelers continued to prosper, particularly with the addition of Joseph “Joe” Ira Lee Jr. when he married Hannah Ruth Johnson, the Johnson’s only child. Joe with, his infamous singing parrot, Poncho, gradually took over the responsibilities of running the store as the Alton and Lena aged. A sight to see in Raleigh, Joe could often be found walking around town with verbose Poncho on his shoulder and a captain’s cap on his head. Through his leadership, the store experienced great success. With each new generation, Johnson’s has been blessed to maintain the exceptional high standards it started with in 1929. Joey Lee III and Dan Hudgins, Joey’s brother-in-law were the next in line to take over. In 1990, Joey and Dan eventually moved the store to its current location in Olde Raleigh Village. The American Gem Society is the country’s preeminent jewelry trade organization dedicated to consumer protection. Which basically means, if you’re looking to buy jewelry, you just clicked to the right website. Since 1934, they have been making it easier and safer to buy jewelry of any kind.Even if you don’t know the first thing about cut and clarity, we can help you, educate you, and point you in the direction; we are dedicated to protecting you with a wealth of knowledge so your decision will be a more informed one. Our exacting standards, technical expertise, and tradition of consistent and uncompromising service has earned us an untarnished reputation that’s as good as gold. We take pride in our relationships, with both suppliers and customers. The relationship we have with our partners is instilled with over decades of trust and support. We set high expectations for our vendors to meet, because we believe that our customers deserve the best and nothing less! We carry Top Designer brands. With a variety of designers, you’re sure to find the perfect pieces to add to your collection. My favorite brands are Lagos, Roberto Coin, Michele, Precision Set and Victorinox (just to name a few). We are constantly acquiring more pieces to our existing lines as well as introducing you to new design trends. Thank you for allowing me to introduce you to Johnson’s Jewelers of Raleigh and myself. I look forward to sharing stories that inspire and educate you on the finer points of buying jewelry and heirlooms of the future. Until next time, Caroline with a cut above the competition!